Everything these days is “green” or should I say, labeled green for marketing purposes (“green-washing”). We all enjoy living in a clean home and environment, but are you cleaning your house at the cost of your health? I always cringe when I walk into a house or room and the strong smell of Clorox greets me. Within seconds my eyes are burning, my throat gets tight and I quickly leave. Why would anyone think that if you can smell Clorox you will know that place is clean? Some of the ingredients in household cleaners, laundry detergents, and even “green” cleaners like Simple Green and Clorox Greenworks can create a toxic indoor environment. Unfortunately reading labels does not necessarily ensure you are buying a product without one of these ingredients as companies are getting “smarter” about what ingredients they omit from their labels. 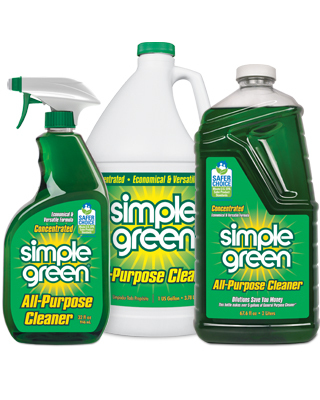 The “green” cleaning niche has captured the attention of large companies with green cleaning product sales reaching $100 million in 2010 and that was just in the US! Glycol ethers – Widespread use in paints, perfumes, soaps, cosmetics and foods. Cause fatigue, lethargy, nausea, and possible liver and kidney damage. Phthalates – Cause reproductive harm, endocrine disruption, cancer, organ damage. Phosphates – Manufacturers have reduced eliminated phosphates from laundry products, but no action has ever been taken on dishwasher detergents. Causes widespread environmental damage. Nonylphenol ethoxylates (NPEs), a common ingredient in laundry detergents and all-purpose cleaners, is banned in Europe, and known to be a potent endocrine disrupter. It’s already thought to be the cause of male fish transforming into females in waterways around the world! Formaldehyde, found in spray and wick deodorizers, is a suspected carcinogen. Volatile organic compounds (VOCs), including 1,4-dichlorobenzene – Cause nose and throat irritation, dizziness, asthma. Petroleum solvents in floor cleaners may damage mucous membranes. Butyl cellosolve, found in many all-purpose and window cleaners. May damage your kidneys, bone marrow, liver and nervous system. Ammonia – irritating to the skin, eyes and lungs. Chlorine – irritating to the skin, eyes and lungs. Ethanolamines – irritating to the skin, eyes and lungs. Sodium Lauryl Sulfate – skin irritant, eye irritant, potential cancer causer. If you want to be sure you are not using these harmful ingredients in your home stock your cabinet with these natural cleaners. Watch this great video on using natural ingredients to make your own cleaning products.